Mirah Belle introduces unadulterated, pure essential oils that improve the health of your skin, hair and body. These 100% Pure Essential Oils offer a variety of benefits from cosmetic, dietary purposes and are known for their healing effects mentally, physically and emotionally. 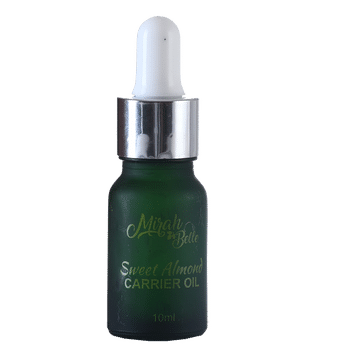 Mirah Belle's Sweet Almond Essential Oil has amazing health benefits and carries protecting and antioxidant properties. It is suitable to be used on skin and hair. Free from artificial ingredients and chemicals. Sweet Almond Oil for the Hair: The main benefit of the sweet almond oil is to protect the hair. The sweet almond oil also helps to make the hair bright, shiny and silky looking. Sweet Almond Oil for the skin: The sweet almond oil contains antioxidant properties and is known to protect the skin against harmful UV rays. It also keeps the skin soft and supple.